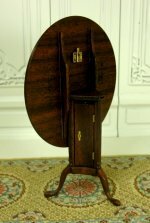 Exquisite Newport tea table by noted artisan Gerald Crawford. 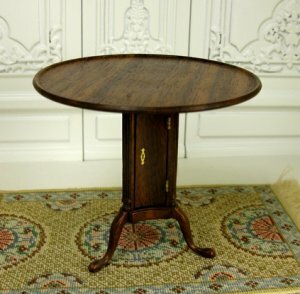 A reproduction from the Winterthur Museum collection, this tea table features a tilt top with a triangular post with curved sides and carved with fluted columns. A door opens to reveal five small drawers. The tilt top secures with a working brass latch. This is truly a showpiece!